THE Abbey of Irrelagh, or, as it usually called, Mucross, Lakes of Killarney, is, perhaps, more generally visited and better known than any ecclesiastical ruin in Ireland. That a church was situated here from a very remote time appears from MSS. preserved in the library of Trinity College. Ware states that it was founded in 1440, by Donald, the son of Teige Mac Carthy, but there is much reason to doubt the authenticity of this account, as the "Annals of the Four Masters," under the year 1340, record the foundation of a monastery here. 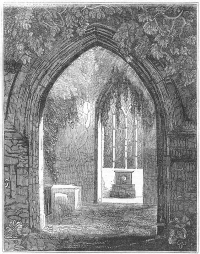 The Abbey, the interior of which, as seen through the entrance doorway, is illustrated above, consists of a nave and choir, separated by a belfry of small proportions, and only designed to hold a single bell. This belfry is pierced by a narrow gothic arching, which connects the nave and choir. On the south side of the nave there is a small transept, with which it is connected by a large archway.